Hidden New Jersey: Yes, we have no Dracula birds... but how about a pelican? Yes, we have no Dracula birds... but how about a pelican? 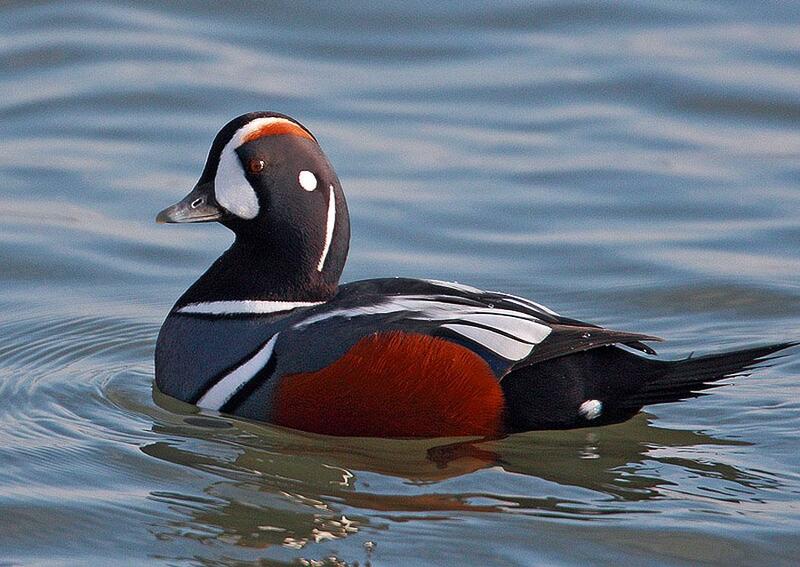 It seems that if you want to find harlequin ducks in New Jersey, you have to work for them. Traditionally, it's a visit to Barnegat Light -- head to the jetty in the state park and walk southward along the riprap that extends beyond the cement walk. It's like a giant video game, forcing you to step carefully from boulder to boulder without falling into the crevices between. I'm a bit more cautious than Ivan when doing this, which you can see from this photo (he's that spot on the distant right, carrying a scope on tripod). 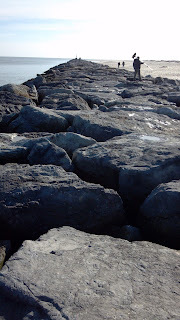 Word is that the riprap-loving harlequins prefer to stay toward the south end of the jetty, requiring the arduous, cautious hike, but I'm not totally buying it. I first saw them several years ago (pre-Ivan) right at the bend in the cement walk, not all that far from the lighthouse. I remember thinking how beautiful and different they were from the standard mallard (not that I don't love the look of mallards...), and that akin to wood ducks, they look like something from a very easy paint-by-number kit. A male harlequin duck. See what I mean? Regardless, the harlequins haven't been in 'my' spot any of the times Ivan and I have gone to see them, so it's meant a trip down the jetty. Well, I go for a bit and then hop down to the sand on the land side, heading back up when something interesting comes along. This time the trip looked promising: we'd already seen a nice group of oystercatchers along a distant sandbar, with a bonus seal thrown in for good measure. With any luck we'd also locate great cormorants, which have been frustratingly absent from our trips so far in 2013. Only the hike down the cement walk, over/through the railing and atop the riprap would settle it. And.... yes. The harlequins were as reliable as ever, swimming busily along the jetty, some actually leaving the water to perch on the rocks. A few loons swam about, as did one constantly-diving razorbill, probably the closest avian visitor New Jersey has to the penguin. But... the cormorants were totally absent. What gives? Perhaps with their Dracula-like wing drying posture, they're in witness protection? At the very least, they're playing a pretty frustrating game of hide-and-seek with us. Still, when nature denies, she inevitably provides a pretty cool substitute. As we continued our scan, a brown pelican glided north over the inlet at about eye level, unmistakable in size and silhouette. A pelican? Now? In New Jersey? Given everything we've seen visit the state over the past year, a late-staying pelican seems like par for the course. One more bird for my state list, and a very early addition for 2013.